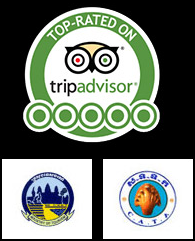 All reservations should be booked throughout CHRISTINAIR TOURS CO., LTD., Phnom Penh. All reservations will be confirmed by return email or fax. In case immediate confirmation is not possible, our office will inform the booking status. All prices quoted in US Dollars. Prices are subject to change without prior notice. Please check with us upon reservation. Full prepayment by bank remittance must be received two weeks before the arrival in Cambodia, to our bank account in Phnom Penh. Our bank in Phnom Penh is Cambodian Public Bank. Beneficiary: Kim Horn, SENG - Christinair Tours Co., Ltd. Remark: All bank service charges will be borne by the payee. CHRISTINAIR TOURS CO., LTD. acts solely as agent between concerned airlines, hotels, transport operators and local tourist offices to provide services required. It is not responsible for any loss, injury or damages sustained by passengers and customers. All additional expenses incurred due to delays, accidents, natural and other disasters, political actions and unrests, shall be borne by passengers and customers.